Hi! 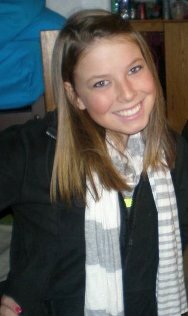 My name is Meagan Engebos and I am about to finish my sophomore year at the University of Wisconsin- La Crosse. I am majoring in Biomedical Science and a second major in Pre-Nursing. I also plan to minor in Chemistry and Environmental Studies. In the future I plan on working somewhere in the health field, and as of right now becoming a nurse, but who knows what the future holds, right? Being from De Pere, Wisconsin (about 10 minutes away from Green Bay), I am quite the avid Packer fan. In my spare time I enjoy hanging out with my friends, listening to music, having fun, and watching sports. I really hope you enjoyed my website and feel free to contact me at engebos.meag@uwlax.edu or my Organismal Biology teachers Dr. Tom Volk (volk.thom@uwlax.edu) and Dr. Greg Standland (sandland.greg@uwlax.edu). Click here to return to the home page or click here to check out my references.